Beautifully engraved specimen certificate from the Transworld Corporation printed in 1979. This historic document was printed by the United States Banknote Corporation and has an ornate border around it with a vignette of a woman holding a globe. This item has the printed signatures of the Company's Chairman of the Board and Secretary and is over 40 years old. Trans World Corporation was the original name of the holding company set up to own Trans World Airlines. In 1967, when the airline sought to diversify into other areas of business, a key investment was Hilton International Hotels, the non-American interests of the Hilton Hotels chain. (Because of this split, the Hilton International chain had to call its hotels in America Vista, while future overseas locations of the American Hilton chain were called Conrad International. This operation was later sold by Trans World Corporation while under the leadership of Charles C. Tillinghast Jr. the CEO of TWA and the first known to receive a golden parachute employment contract. Trans World Corporation, the owners of the airline company, and TWA's successor Chief executive officer ( L. Edwin Smart), spun off Trans World Airlines and sold it to Carl C. Icahn in 1983, and the holding parent company that owned TWA was then liquidated in 1986. At the time of TWA's spinoff from Trans World in 1983, Trans World had owned Spartan Food Systems Inc., the Canteen Corporation, Hilton International, and Century 21 Real Estate Corporation. 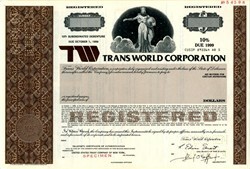 As a result of both companies Trans World Airlines and Trans World Corporation being publicly traded prior to the spinoff, public records permitted analysis which indicates "wealth transfer" of a sale of TWA was as much a reason for the sale of TWA as was a desirability to "restructure union contracts".Conversely, it was circa 1982-1984 when UAL Corporation and AMR Corporation, the parent companies of United Airlines and American Airlines first took shape. This period is also an era marked by extremely competitive airline industry forces fighting for deregulation survival along with fighting for opportunities of vast individual creations of wealth characterized by those accumulated by leading industry figures but sullied names such as Frank Lorenzo and Carl Icahn during the 1980s. L.Edwin Smart was to remain head of TW Services Inc., the successor of Trans World Corporation which remained headquartered in the same building and shared many directors as the Trans World Corporation holding company. The holding company then changed its name, first altering it slightly to Transworld Corporation, then to TW Services, reflecting its continued use of the TW ticker symbol on the NYSE. - which was to become a business centered on food services and retirement care. TW Services was formed at end of 1986 upon the dissolution of Transworld Corp.
TW Services was the target of several hostile take over attempts which ended in June 1989 when TW Services agreed to be taken over by Conniston Partners for $1.65 billion. As part of the buy out, TW Services moved its headquarters from New York City to Spartanburg, South Carolina.